Mannum, South Australia is situated on the Murray River about an hour and twenty minutes drive from my home town of Gawler. If you've been following recent posts on this blog then you may be wondering if my frog van was up to this distance. Fortunately the day before Rose and I spent a very damp afternoon at The Gorge Wildlife Park located in the Adelaide hills about forty minutes south of Gawler. The van had not only got us there without any real problem but had also negotiated some pretty steep hills (one of which had me right down to second gear to make the steepest sections). After that a drive to Mannum should be easy. Before I get back to Mannum, I didn't write about The Gorge Wildlife park because I've already covered it in 2007 with my post, Gorge Wildlife Park, Cuddle a Koala. That previous trip we had a much better time and weren't rained out. Back then I took 137 photos, this time I took only one and it was a bad photo of a dingo. Right, that out of the way, Mannum. The town of Mannum held an 'Open Weekend' for their houseboat hire industry where you could go along and inspect a considerable number of houseboats for hire. Rose and I went along on the Saturday. The Murray River in Australia has received plenty of media coverage of late due to the droughts we've been experiencing. Often regarded as the life blood of Australia (well at least three states anyway) the water levels have dropped considerably in recent years making water for irrigation extremely scarce. In the media the river is often depicted as dried up however this isn't the case. There is still more than enough water to enjoy a houseboat holiday. In fact if it wasn't for the markers and jetties indicating where the water level used to be you'd probably never even realize that the Murray river was far lower than it used to be. For example in the photo above of the Murray Princess (which is a luxury paddle steamer and local tourist attraction that you can book cruises on) if you look at the shore in the foreground you can see the water level should be nearly up to the green grass of the park lands. On our first day at Mannum Rose probably looked through every houseboat, whilst I managed about half before I decided they were all starting to look a bit 'samey' just with different decor. That's not to say it wasn't fascinating to begin with. Some of these boats were bigger and had better kitchen's, lounges, bathrooms and bedrooms than just about every house I've ever lived in on land. Not only that but most had room for two to three bathrooms all of equal size! Granted many of the house boats were considered five star accommodation, with virtually all of them having a full size spa on the upper deck, but still, for house boats - I'd consider living in one full time! One particular highlight was this three level houseboat you can see in the photo on the right. The interior on this was stunning. I swear I wouldn't know what to do with all the rooms and space. I'd also have trouble finding ten to twelve friends that I could take a holiday with to fill it. The very first houseboat we looked at was also both Rose and I's favorite. Unlike all the others it utilized half the lower decks floor space (from front to back) as open plan shared living space. The other half was filled with two bedrooms and two bathrooms. The effect was a much more spacious boat than most of the other boats which seem to use the front of the boat for shared living space and the middle to back for bedrooms and bathrooms. The upper sun deck simply had a full size spa and room for an out door table setting from which to enjoy the scenery. Rose found out this boat was for sale and did some serious talking with the boat manager's step daughter, who was looking after that particular vessel during the open day. I think she nearly talked Rose into actually investing in a houseboat (but not quite). By the time we'd finished looking at all the houseboats we were running out of light so decided to head home for the day. The trip back was a real drama in its self because I got lost twice, extending out trip by at least another thirty minutes. Damn maps, a lack of good road signs combined with darkness all conspired against me. 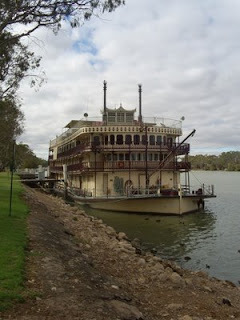 After a frustrating time getting home we took a break on Sunday to just relax then headed back to Mannum on the Monday. I figured that since we'd worked out how I'd managed to get lost we may as well go back whilst all the road routes were still fresh in my mind. Mannum does have more to offer than just houseboats. Rose wanted to walk through the Visitor Information Centre's history Museum and hoped to get a tour of the Marion - a completely restored and working paddle steamer originally built early last century. Unfortunately we didn't get to look through the Marion due to a school group having taken over the boat for the afternoon however the Museum was extremely interesting though largely focussed on one significant event. The 1956 Floods. Rose and I learnt that in 1956 all the lower wetlands across three states - which include the Murray River flooded to record levels. If you look at the photo on the right you'll see a tree stump monument dedicated to the floods that includes a measuring stick. The mark right at the top... that's the level of the 1956 floods in Mannum. 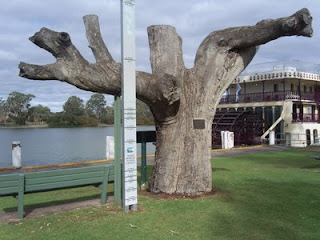 If you look behind the tree stump in the photo you'll see the back end of the three storey paddle boat, the Murray Princess. If the boat stayed at its present level and the water rose to the height of the floods, you might be able to stand on its roof without getting your feet wet. One particular story the museum's video on the floods relates is how the local pub managed to stay trading even though it's entire ground floor filled with water nearly to the ceiling. They simply knocked out a section of railing on the upper floor so people could pull up in their boats and climb onto the balcony. Apparently things worked really well until the water levels started backing up the sewerage system and the toilets in many of the buildings simply exploded with raw sewage coming back up the pipes. Yummy! After the museum we decided to seek out some water falls that Mannum is known for. We hadn't been able to find any brochure that actually contained detailed information about where they were located. However Rose did find a photocopied, hand drawn map that looked fairly straight forward and easy to follow. How wrong we were. Here's a hint to anyone drawing a street map - try writing on the name of the roads. You may be able to find things by distance traveled and their relationship to one site specific landmark but the rest of us are used to street directories and maps with the actual names of roads. We looked everywhere for these waterfalls, back tracking and more but had to give up as we started to run out of light (I didn't want to be driving home in the dark this time). I swear we followed the map but along the way could not find one single street sign that said 'Mannum Falls'. If it wasn't for a single photo of them in one of our extremely unhelpful color brochures I'd say Mannum Falls don't exist. If you've been there and taken a photo place a link to it in the comments below. I'd love to see what I missed. With that our trip to Mannum was over. The drive home was uneventful and only notable for the fact that I didn't get lost and the Frog van didn't break down at all. 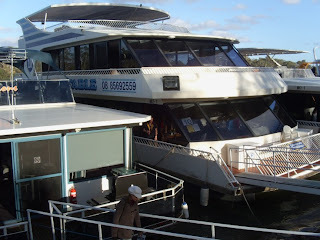 Mannum is a very picturesque, historical town, great for a day out or as a stop on your next houseboat holiday... you won't get sea sick or anything. Rose and I actually rode on one of the houseboats whilst there and we barely noticed any rocking motion at all - even when it was moving along. NavMan: Telling YOU Where To Go!